I said I’d have a poll up for today, but I’m still blanking on a topic. I’m going to discuss it with Cory this weekend and we’ll have something for you Tuesday. I’m still working on colouring this batch of pages–I’m not sure why I thought I’d be able to get them coloured by today. Inking them took forever just because of how complicated the BGs were, and colouring them is taking longer than usual, too. 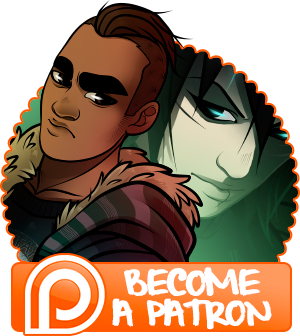 I’ll have them done by Sunday for Patrons, but man, I was hoping I’d have them done by tonight. You can see little previews of them over on my twitter, and I’ll be posting more later today once I’m awake. Anyhow, enjoy! We’ll be back on Tuesday!